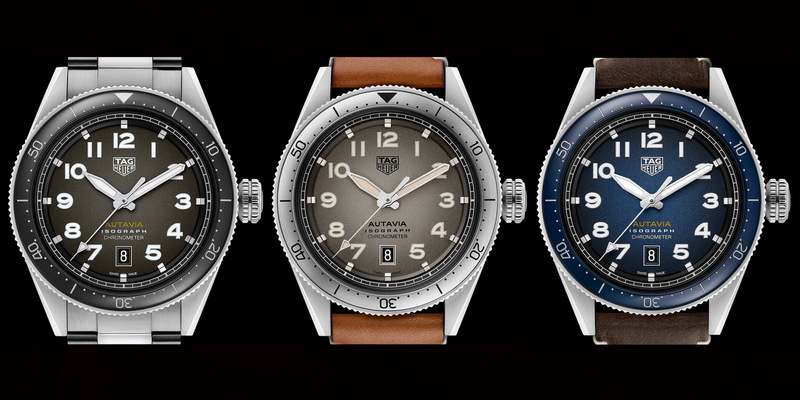 March 20, 2019 is a historic day for TAG Heuer. In 1933, Heuer introduced its Autavia dashboard timer, a 12-hour stopwatch designed for AUTomobiles and AVIAtion. In 1962, the Autavia name moved to the new chronographs that the company introduced, again with the features designed for racers, rally navigators and pilots. 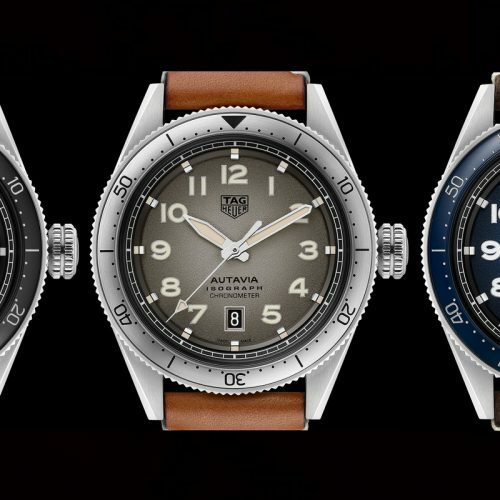 Today, TAG Heuer has introduced its first “three-hand” Autavia, called the “Isograph”, a wristwatch with hour, minute and second hands, but no stopwatch features. I will be in Basel tomorrow to see the actual samples of the Autavia Isograph. So I will wait until tomorrow, to see the watch in the metal, and then share my impressions of the watch. In this posting, we will provide a quick overview of Heuer’s historic Autavias (dashboard and chronograph) and then have a look at the new Isograph Autavia, to understand the origins of the various elements of the watch — case, dial, hands, movement, etc. 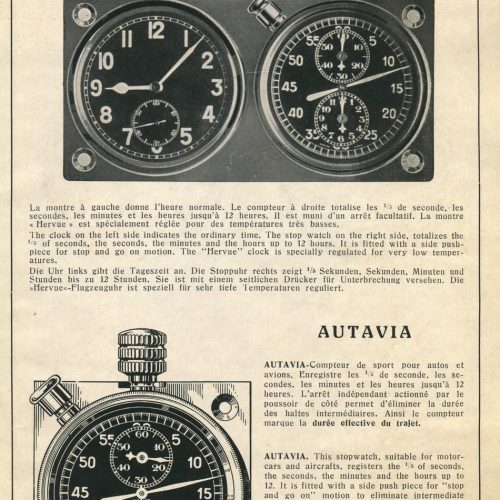 Heuer introduced its Autavia dashboard timer in 1933. 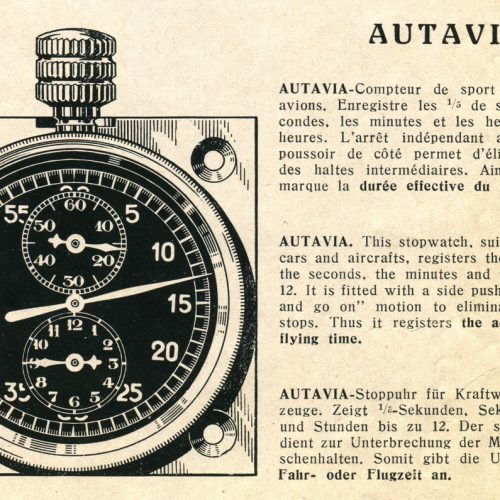 The Autavia dashboard timer was a 12-hour stopwatch, with the recorder for hours at the bottom of the dial and the recorder for the minutes at the top of the dial, with the center-mounted hand showing the seconds. 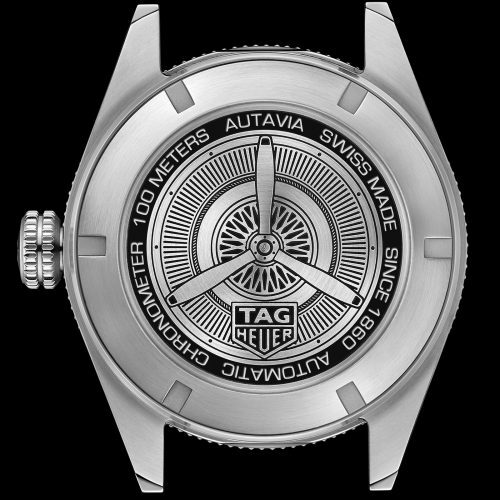 On the first version of the Autavia, the large crown at the top winds the timer, and also provides the start and reset functions. The pusher at 11 o’clock stops and restarts the timer, allowing the user to have time-in / time-out capability. 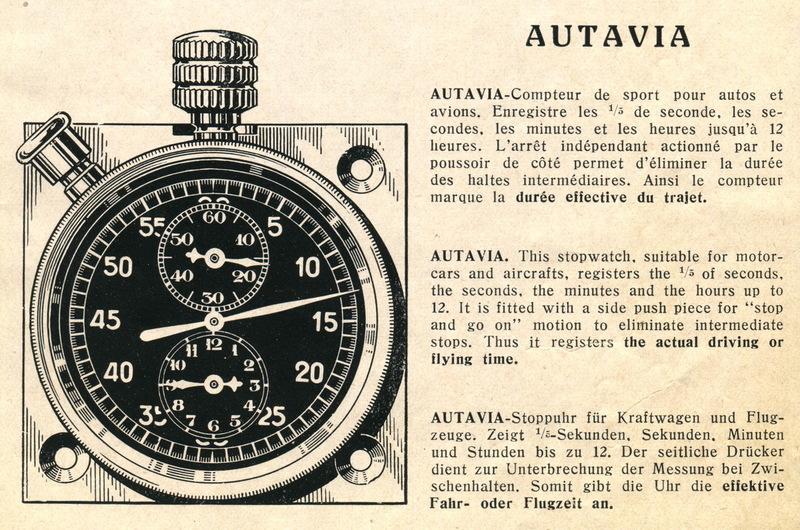 On the later version of the Autavia timer, the crown provides start and stop functions, with the pusher – now located at 1 o’clock – resetting the timer to zero. 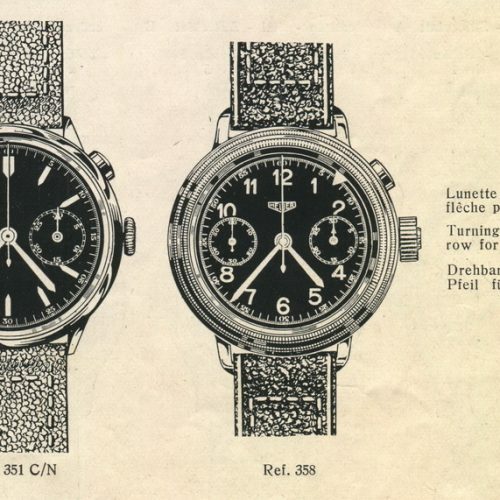 The Autavia was typically paired with Heuer’s 8 day clock (called the Hervue), with the pair also being listed in Heuer catalogs as the “Hervue”. Heuer discontinued the Autavia in 1957, with the model being replaced by the Monte Carlo 12-hour timer. The Monte Carlo used a disc to indicate the hours, with both the minute and second hand being center-mounted. Throughout the 1940s and 1950s, Heuer’s chronographs were known only by their reference numbers, Reference 346, 2444, etc. 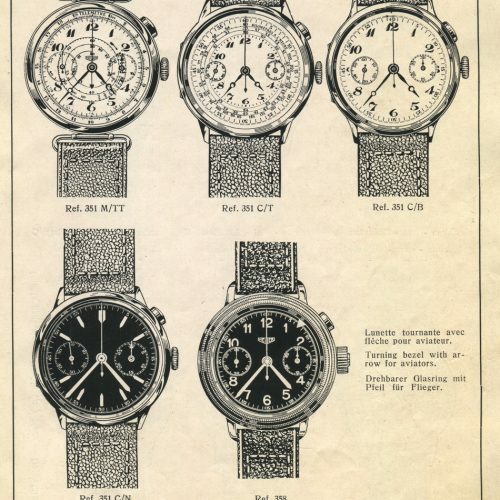 In 1962, Jack Heuer realized that it might be advantageous for the company’s chronographs to have model names, and with the name “Autavia” now being unused, the Autavia became the first Heuer chronograph to have a model name (other than some limited production models, such as the Mareographe). The Autavia was offered in a three register model (with a 12-hour recorder) and a two register model (with a 30 minute recorder). 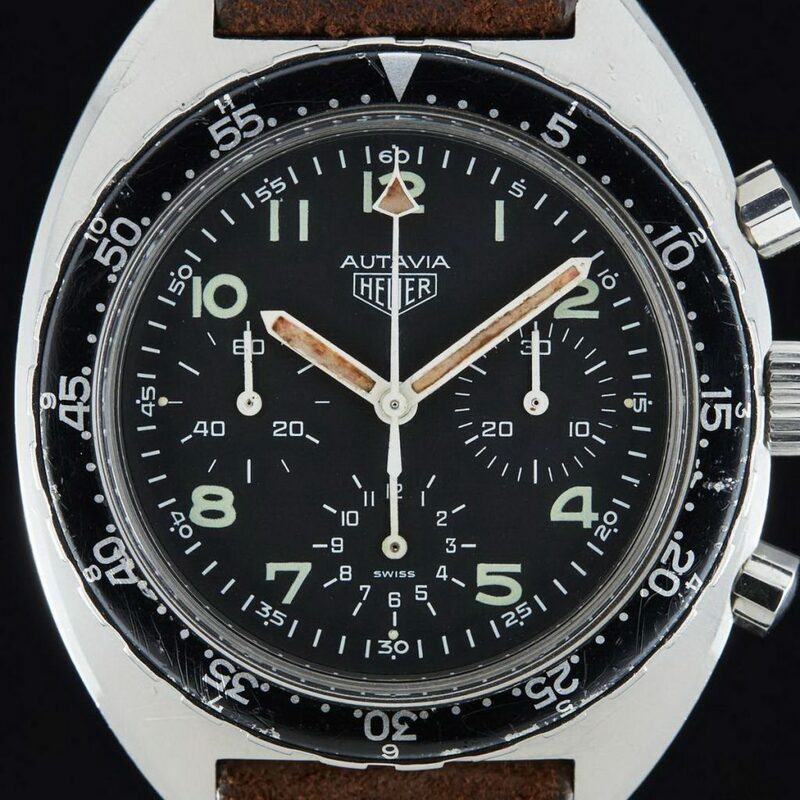 Over the next 23 years, Heuer produced over 85 different models of the Autavia, with cases transitioning from the original screw-back cases, to the more waterproof compressor, snap-back cases (in 1968), to the larger cases built to house the automatic movements (from 1969). 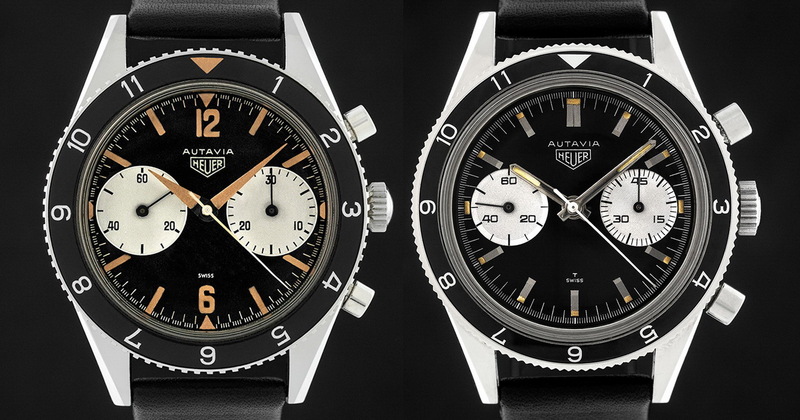 The manual-winding Autavias of the 1960s had black dials with white registers, in stainless steel cases. 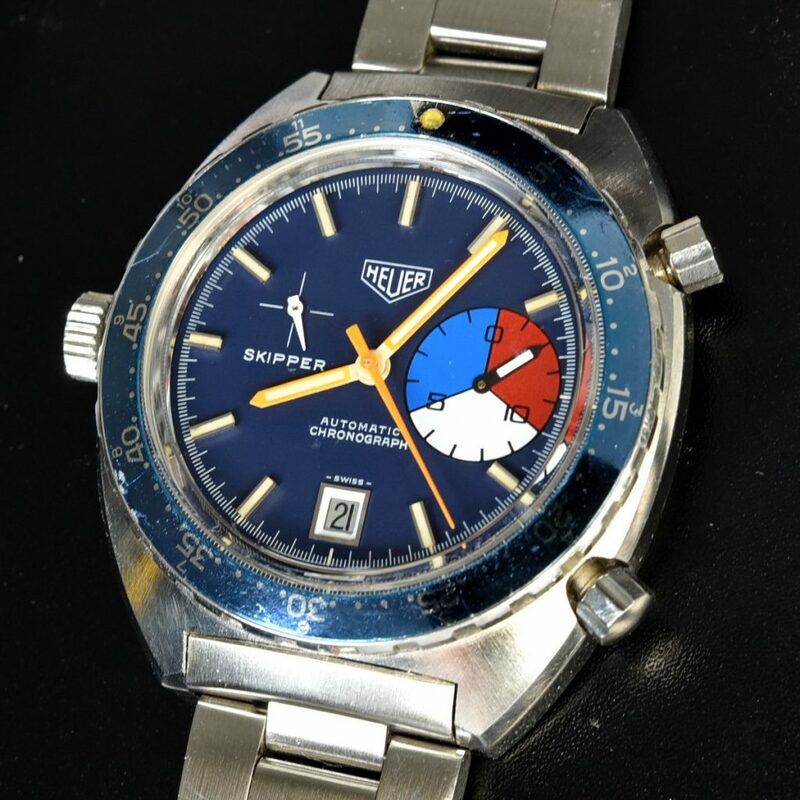 The 1970s saw the introduction of silver and white dials, with a variety of accent colors for the Autavia line (with red, blue and orange being used most often). 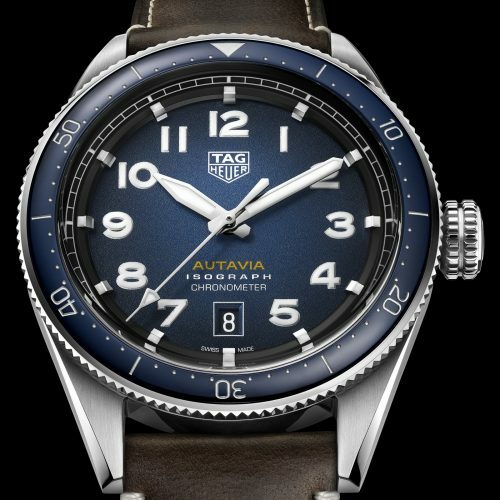 The Skipper, a modification of the Autavia for yacht timing, used a distinctive blue dial and bezel for many models. 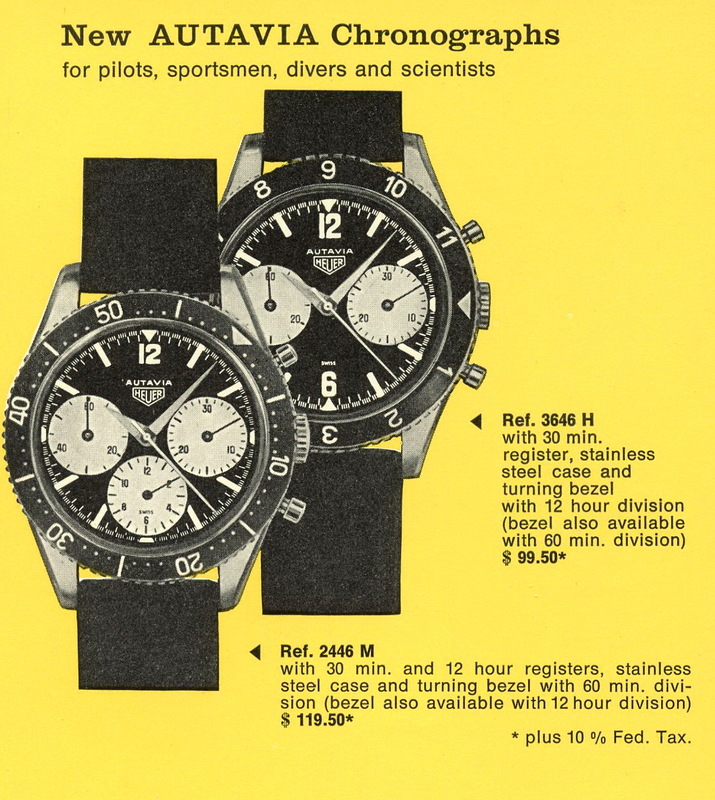 At the end of the line, in 1985, Heuer offered cases coated in olive drab, gray, gold and black, with the dial matching the case in each of these models. Over these three decades, the defining feature, shared by all the Autavia chronographs, was a rotating bezel. 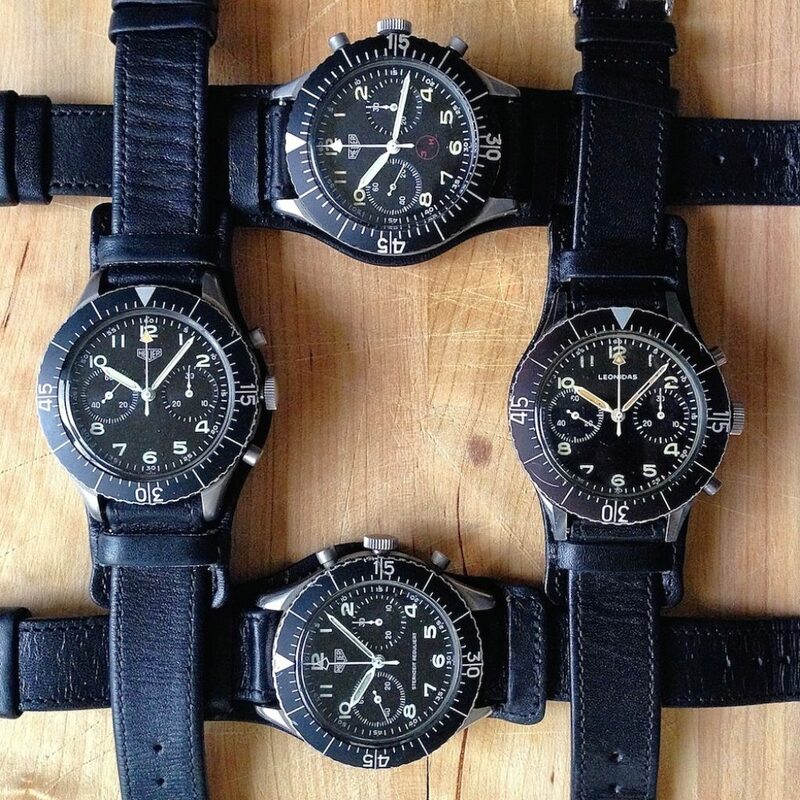 Bezels were marked for hours, minutes, hours and minutes (on a single bezel), tachymeter and decimal minutes. The bezels on the GMT Autavias were red and blue, and marked for the 24 hours in a day. 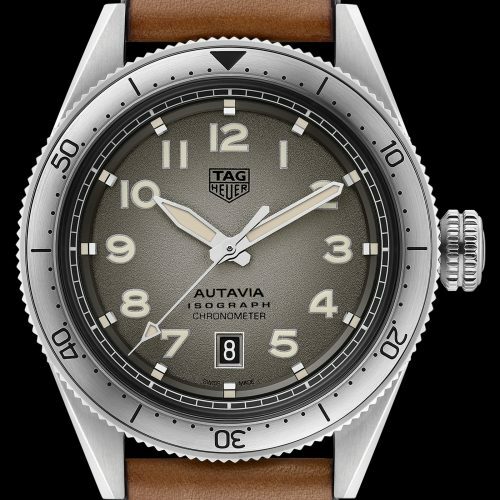 The Autavia was first re-issued by TAG Heuer in 2003 (Reference CY2111), with two stainless steel and one 18 karat gold models, however these models did not prove to be popular. TAG Heuer introduced a new line of Autavia chronographs in 2017, and approximately 10 versions of this chronograph have been offered in the last two years. Having covered the historical predecessors, we turn to the Autavia Isograph, introduced today by TAG Heuer, as the first “three-hand” version of the Autavia (i.e., a simple watch, with no stopwatch (chronograph) function). We will have a look at the key elements of the Isograph (case, dial, hands, etc. ), to understand which elements were derived from the Heuer heritage portfolio and which have other origins. 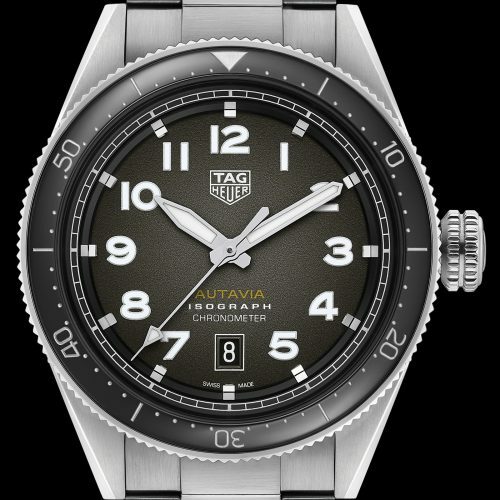 Before digging into the watch, we note that the new Autavia bears the “TAG Heuer” logo at the top of the dial. 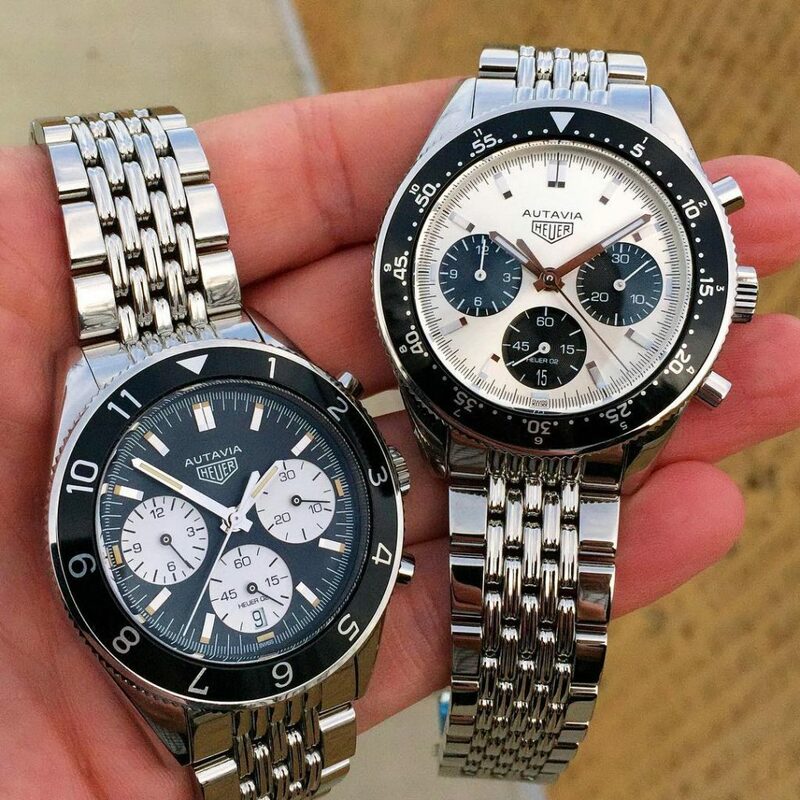 This tells us that TAG Heuer is positioning the new Autavia as a new watch in the TAG Heuer line-up, and not a re-issue of a vintage model. This makes good sense – and may quiet some howling from the vintage enthusiasts – as there is no precedent for a three-hand Autavia watch. By foregoing the use of the Heuer logo, TAG Heuer announces that it is operating under a license to draw an entirely new model on a white sheet of paper, rather than being constrained to elements that Heuer used for its historic models. 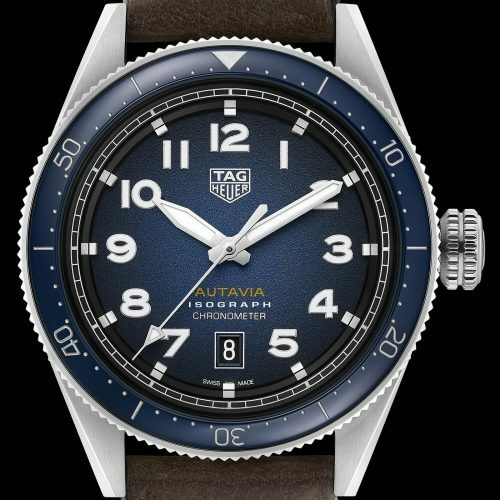 The dial of the new Autavia Isograph draws on two elements that Heuer used on its chronographs from the 1930s, as well as the Autavia timer. First, the “Flieger” chronographs of the 1930s and the Autavia and Hervue clock all used large Arabic numerals to indicate the hours. 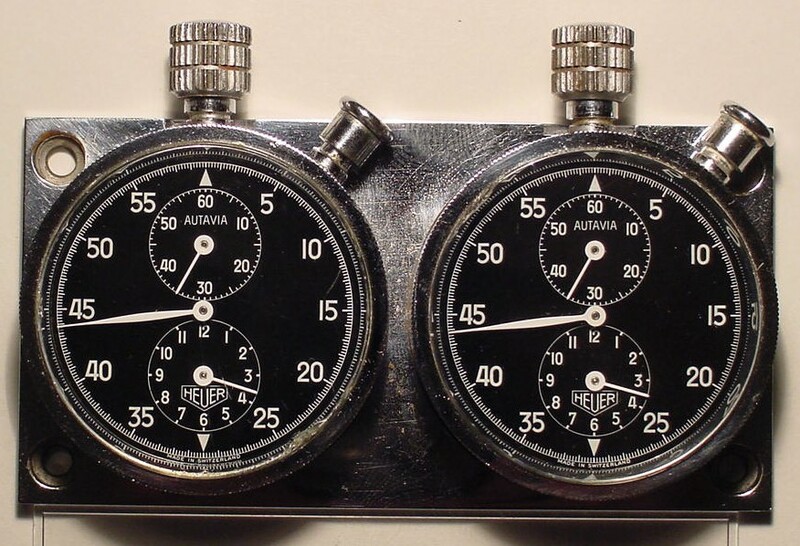 Second, the dials of the Flieger chronographs and Autavia timers both used “railroad tracks”, either around the edge of the dial or on the chronograph recorders. Arabic numerals are standard issue for pilots watches, perhaps being more reliable than simple markers, for the pilot to read the time. 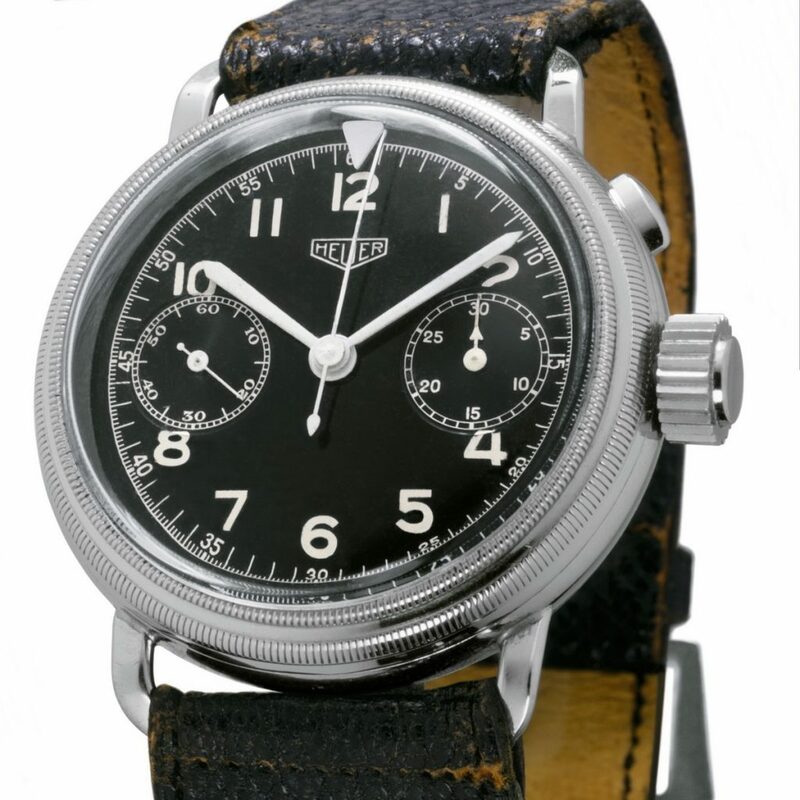 The use of a full line-up of Arabic numerals on the Autavia (rather than only for the “12” and “6”) came in the 1970s, on a model which collectors call the “Flieger”. The oversized crown of the new Autavia Isograph is a final element that may have been drawn from the 1930s, with the crown on the Flieger having a similar geometry. 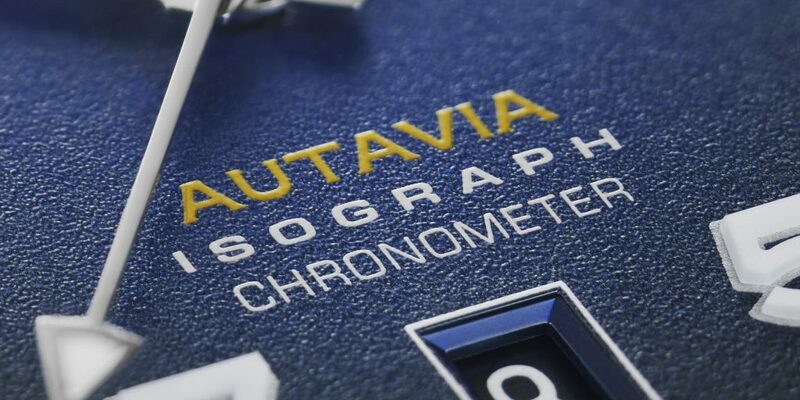 The case of the Autavia Isograph appears to be a faithful reproduction of the second execution screw-back case that was introduced for the Autavia chronograph circa 1967, with the size of the new Autavia case increased to 42 millimeters from the 38 millimeters of the original. 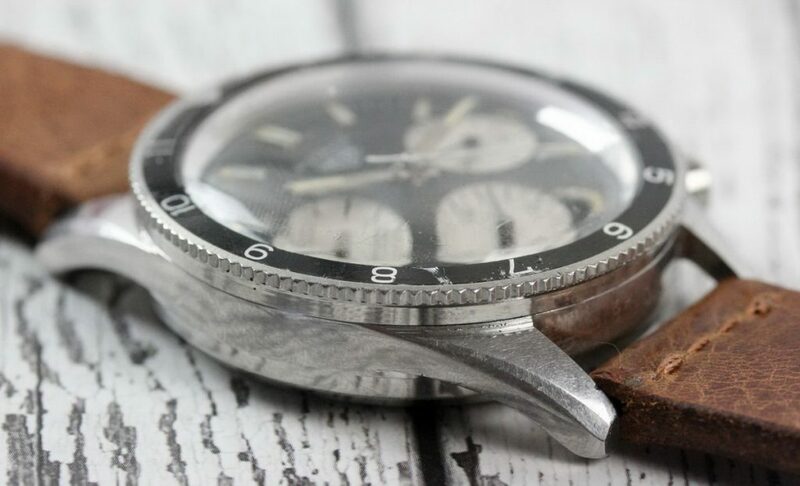 While the first execution screw-back Autavia case had a wider bezel with the teeth cut in a rectangular pattern, the bezel is narrower on the second execution case, and the teeth are cut with a diagonal / triangular pattern. The lugs on both the first and second execution Autavia case have three surfaces, with a beveled edge connecting the top and side surfaces. The use of a bezel marked for minutes is also consistent with many Heuer chronographs from the 1960s and 1970s. Pilots watches typically use a minutes bezel, with the Heuer Bundeswehr being a well-known example of this bezel. The date on the new Autavia is another distinctly 1960s feature of the watch. Heuer added a date disc to the Carrera in 1966, while the first Autavia to have a date came circa 1968, with the Reference 7863C (compressor case). 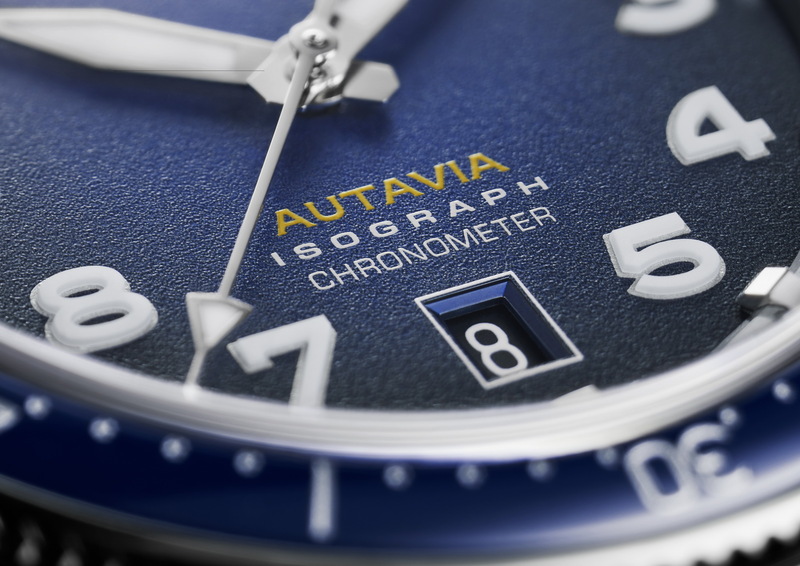 The Autavia Isograph watches introduced today have three dial colors – black, gray and blue. 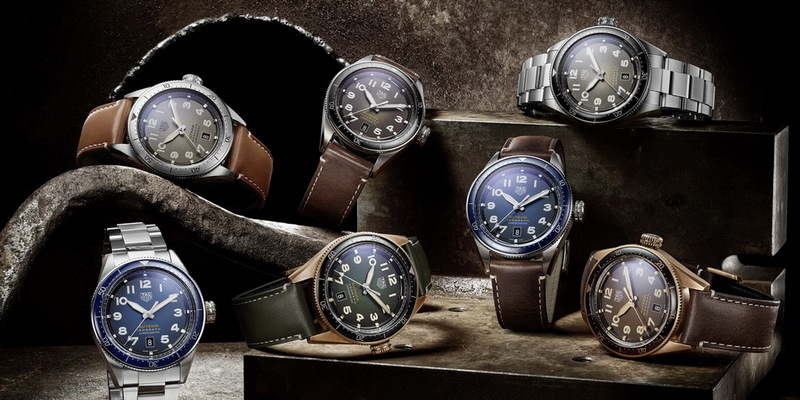 TAG Heuer refers to the finish of the paint as “smoked” or “gradient”, meaning that the paint gets lighter toward the center of the dial and is darkest at the outer edges of the dial. 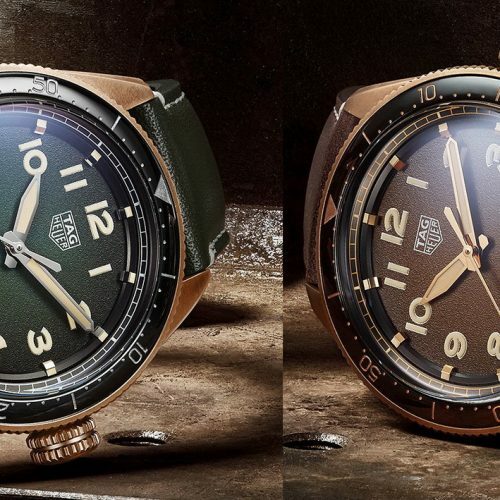 In addition to the three colors introduced today, later during the year, TAG Heuer will introduce bronze-cased Isographs, with the dials being either green or brown. 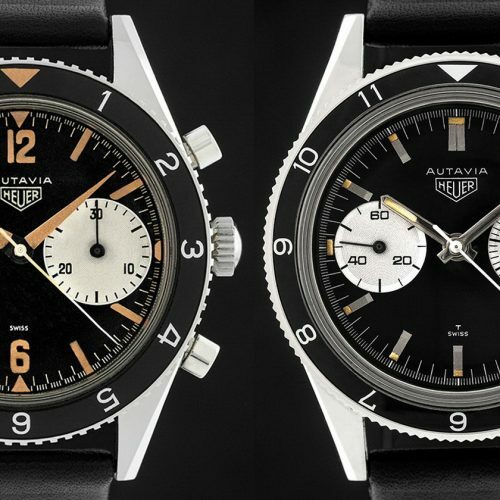 While the Autavia chronographs of the 1960s were limited to black dials, the use of a variety of colors in the Autavia Isograph model line has good precedent in the Autavias of the 1970s and 1980s. 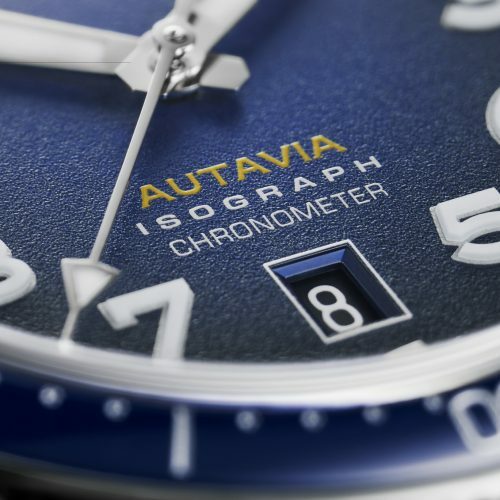 In fact, with the exception of the brown dial that will be used in the bronze case, each color used for the dial of the new Autavia Isograph has precedent in the Autavias of these decades. 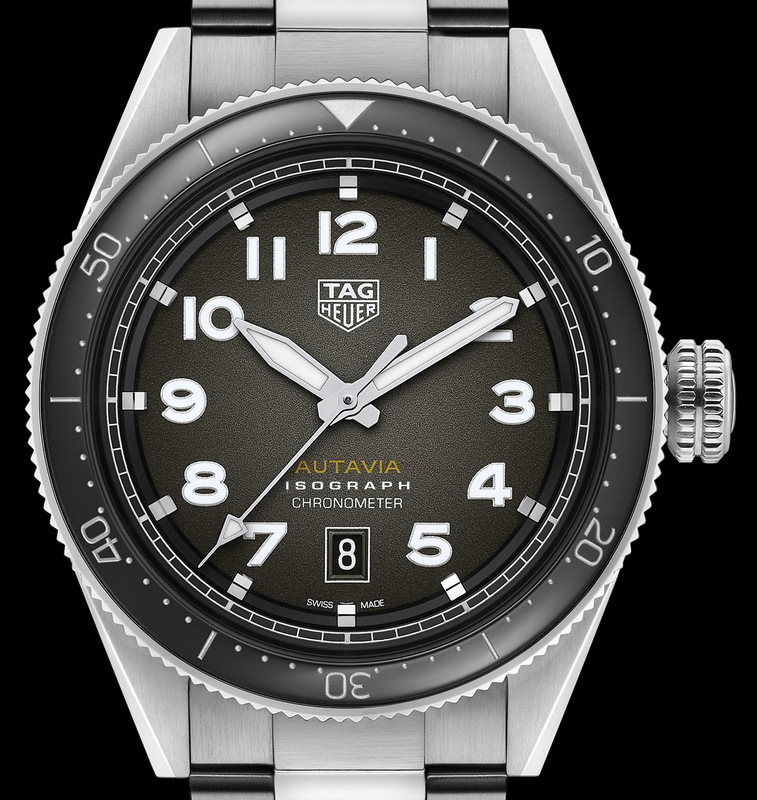 The Calibre 5 Isograph movement in the new Autavia represents a combination of some relatively old technology, that has been used for decades, along with some cutting edge technology recently developed in TAG Heuer’s most advanced design laboratories. The Calibre 5 movement is based on a Sellita movement, which was derived from the ETA 2824 movement, and this ETA workhorse dates back to the mid-1950s, when automatic watches were first becoming popular. TAG Heuer began using the Calibre 5 in 2009, and the movement has powered the Carrera, Aquaracer and Formula 1 models. Based on the ETA 2824-2, the Calibre 5 movement uses 25 jewels and provides a 42 hour power reserve. It moves at 28,800 vibrations per hour. 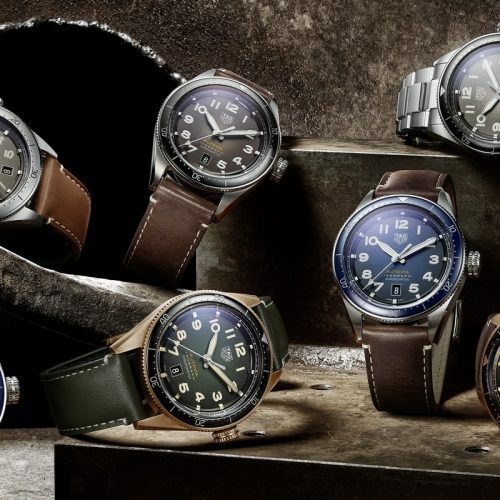 The Calibre 5 and its predecessors may have been workhorses of the Swiss watch industry for decades, but when we track the history of the Calibre 5 movement, we will mark March 2019 as the moment when TAG Heuer modified the Calibre 5 movement by incorporating the brand’s new carbon-composite hairspring. 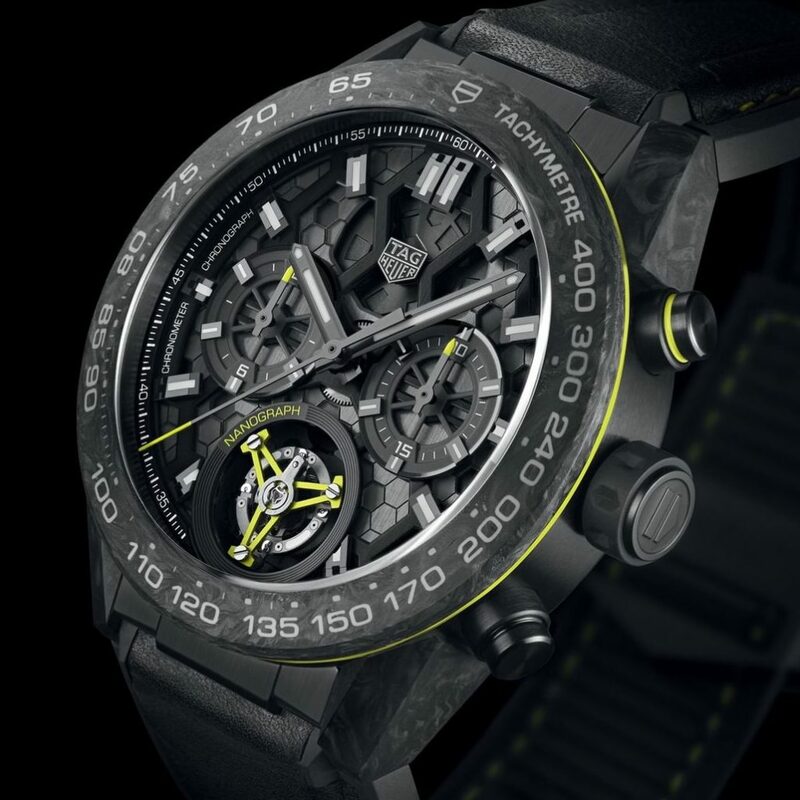 TAG Heuer introduced this new hairspring technology earlier this year, in the Carrera Calibre Heuer 02T Tourbillon Nanograph, a watch retailing for $25,500. 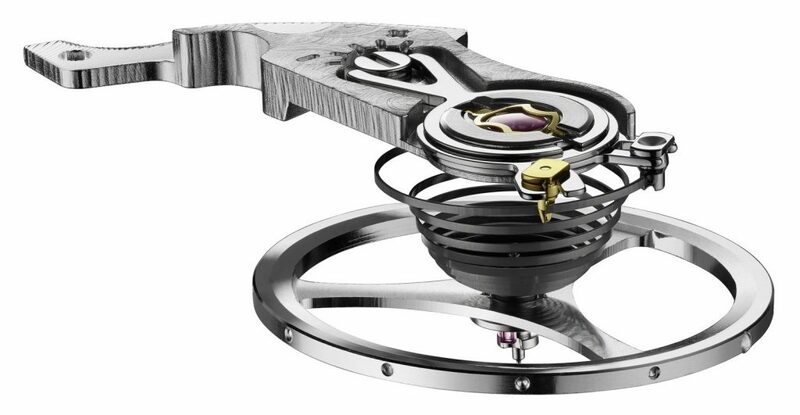 Now, TAG Heuer has incorporated a hairspring that uses the same technology and material into the Calibre 5 movement. TAG Heuer suggests that the new Isograph technology offers key benefits over traditional hairsprings, including better impact resistance, reduced sensitivity to gravity, insensitivity to magnetism and targeted compensation of the temperature effect. 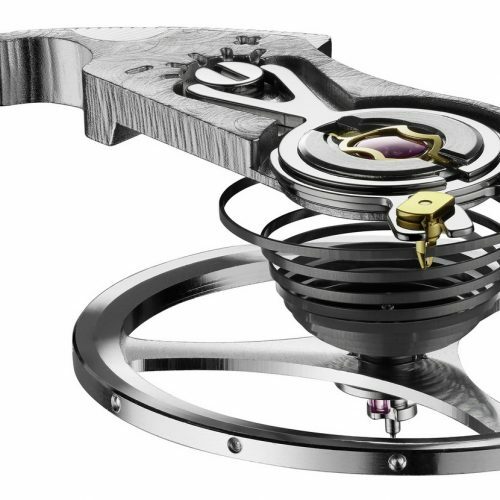 The new hairspring excels in providing the balance wheel with isochronism, meaning that the balance will take the same amount of time time to complete a swing, even if the size of the swing may differ. The superior isochronism delivered by the new carbon-composite hairspring provides the source for the new “Isograph” name. Before Anthony Bourdain created the food and travel show, “Parts Unknown”, I thought of it as a term used in professional wrestling. As a fan of the sport in the 1960s, the competitors were divided between the good guys and the bad guys, with many of the villains using stage names (such as Mr. Wrestling and The Destroyer) and wearing masks. The identity of the masked villains was kept secret, and they were always introduced as being from “Parts Unknown”. The term “parts unknown” can also be a useful phrase as we study the anatomy of certain watches. As described above, most elements of the new Autavia Isochron can be traced to predecessors in the Heuer heritage portfolio — the geometry of the case, the colors, details of the dials, etc. The one exception on the new Autavia is the hands, which consist of a dagger-shaped hand for the hours and an “index” style hand for the minutes. I have done some searching but remain unaware of any previous use of similar hands by Heuer or TAG Heuer. 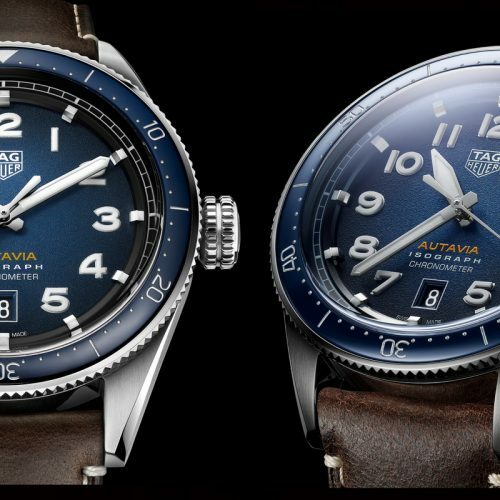 Oddly enough, the closest precedent for this style of hands that I am aware of would be some pilots chronographs produced by Citizen over the past few years. The hands would appear to provide excellent legibility, with this being enhanced by the different shapes of the two hands. 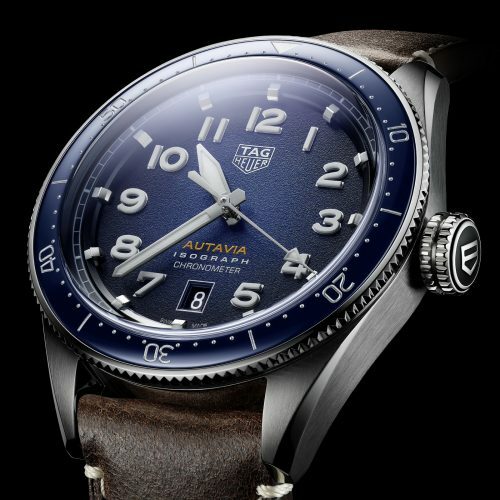 Again, with the TAG Heuer name at the top of the dial and this being the “first of class” in a new collection of Autavia watches, there was no reason for TAG Heuer to be limited to the historic portfolio. Having examined the key elements of the new Autavia Isograph, I am tempted to share my impressions of the watch. 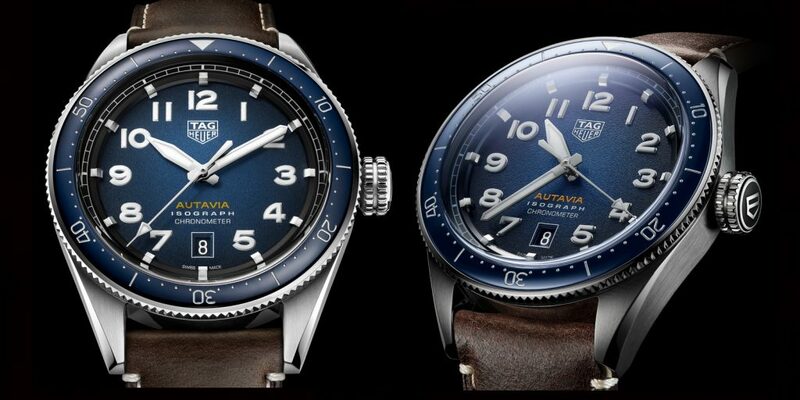 I will resist this urge, however, as I will be traveling to Basel later today, to see the watch “in the metal”. 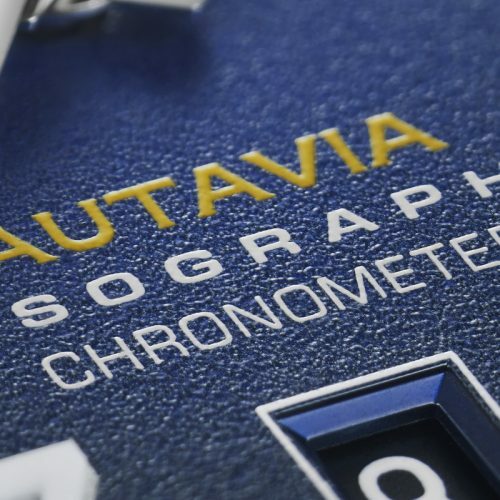 We can say, however, that despite the fact that the new Autavia Isograph is the first Autavia to have only three hands, the watch is firmly rooted in style of Autavia predecessors (with the one exception being the hour and minute hands). Yes, I am looking forward to seeing this one “in the metal” and seeing what all these elements look like, assembled together within the 42 millimeters of the watch. Movement — Automatic Calibre 5 with new in-house Isograph hairspring, COSC chronometer-certified, diameter 26 mm, 25 jewels, balance oscillating at a frequency of 28,800 vibrations per hour (4 Hz), 38-hour power reserve. Price — steel bezel and leather band is $3,500; ceramic bezel and leather strap is $3,600; ceramic bezel and steel bracelet is $3,950 (with NATO strap included).